anti-clockwise as it's 40 metres shorter and I was in a hurry. "Twisting Throttle Australia" recounts the ride. I was riding due west and the sun was low in the sky. It was frying my head inside the helmet so I opened my visor… a bright green fly flew in and perched on the lining of my helmet. The outback is the ultimate leveller – the fly depended on me for a lift and I might need to eat it. 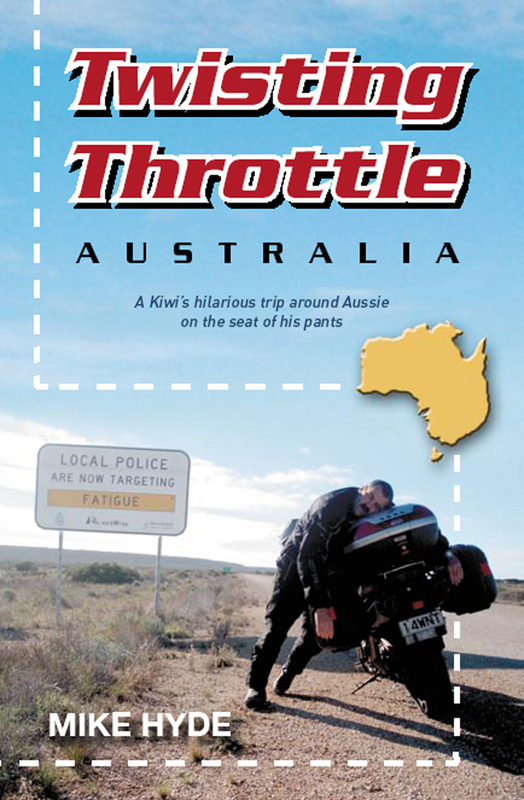 Twisting Throttle Australia is the witty tale of a mid-life crisis which took an ordinary Kiwi bloke around Australia on a motorbike, to fulfil Easy Rider-inspired dreams of his long-lost youth. The result is a very dry look at the Big Dry Country, told with self-deprecating wit and uncompromising humour. Unlike the big boys who cruise the world on luxury bikes, this endearing and extremely funny tale is about an ordinary bloke doing it on the smell of an oily rag - with some wonderful seat of the pants results. Be there for the invention of Dr Throttle’s Bikesthenics, be baffled by incomprehensible Aussie salutations, and share the sadness of Glovey’s passing, as Mike mercilessly pokes fun at himself and the Aussies. This is his first book; one with a real heart and a real difference for real blokes who ride real bikes. Definitely one for every middle-aged man you know - and their wives!